Named after the Horus Narmer, whose titulary appears on both its faces, the Narmer Palette is a flat plate of schist about 64 centimetres in height. Its size, weight and decoration suggest that it was a ceremonial palette. 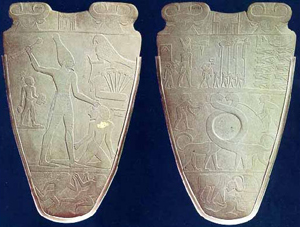 The Narmer Palette was found in Hierakonpolis, the ancient Pre-Dynastic capital located in the south of Egypt, by the British archaeologist J.E. Quibell during the excavation season of 1897/98. The Palette was found along with other artefacts stemming from the early beginnings of the recorded history of Ancient Egypt: fragments of a ceremonial mace head belonging to Narmer and some other mace head fragments inscribed with the name of the Horus 'Scorpion', one of Narmer's predecessors. The exact finding circumstances of the palette have not been noted and there appears to be some contradictions in the publication of Quibell's work at Hierakonpolis. The animal's heads are drawn from the front, which is rather uncharacteristic of later Egyptian art. In most publications, these heads have been described as cows' heads, interpreted as an early reference to the cult of a cow-goddess, perhaps even Hathor. It is, however, equally possible that the animals are bulls and that they refer to the bull-like vigour of the king, a symbolism that continues to be used throughout Ancient Egyptian history. 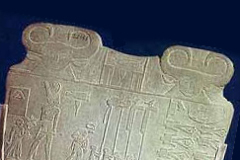 Most of the back of the palette is taken up by a finely carved and highly detailed raised relief showing a king, undoubtedly Narmer, ready to strike down a foe whom he grabs by the hair. This pose would become typical in Ancient Egyptian art. He wears a short skirt, an animal's tail and the White Crown normally associated with Upper Egypt. Behind him an apparently bald person holds the king's sandals in his left hand and a basket in his right. The signs written behind this man's head may denote his title, but their exact reading and meaning are unsure. The fact that the king is represented as barefooted and followed by a sandal-bearer perhaps suggests a ritual nature for the scene depicted on the palette. The king's victim is kneeling before him, his arms flung next to his body, as if to indicate that he was bound. Apart from a girdle, he is represented naked. The contrast between the naked victim and the clad king perhaps denotes that the victim was considered barbaric. The two signs behind his head, probably to be read as Wa-shi, could be the victim's name. 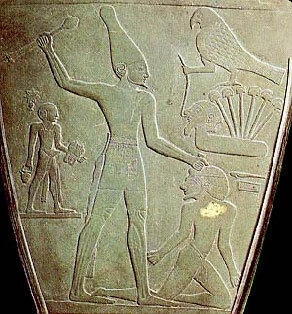 If this is indeed the case, then Narmer found him an opponent of such importance that his name was to be perpetuated. It is not entirely unlikely that this man was the leader of an important group or community conquered by Narmer. Above the victim's head, facing the king, a personified marshland is represented: the left side of a piece of land or swamp is decorated with the head of a man, somewhat reminiscent of Narmer's victim. Out of that land, 6 papyrus plants are growing, indicating that this land was a marshland. A falcon, symbol of the king, is perched on top of the papyrus plants and appears to draw the breath of life out of the nostrils of the marshland's face.